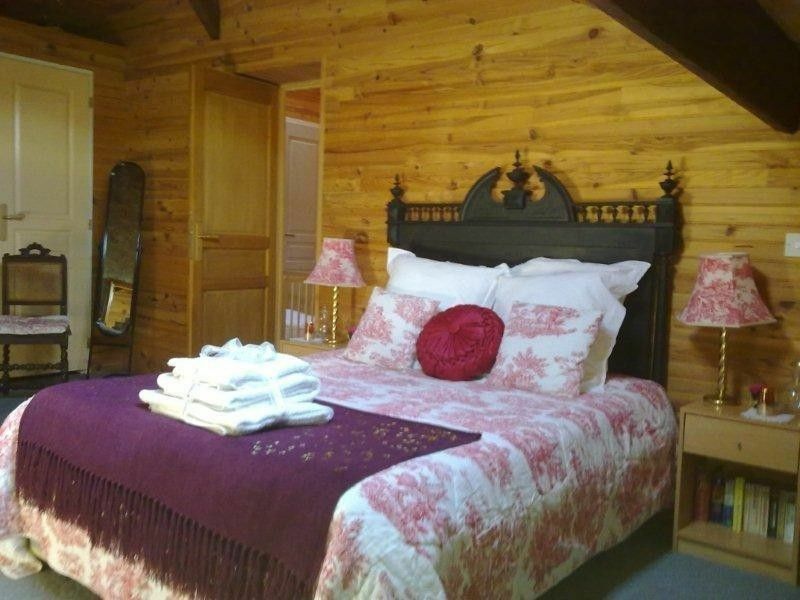 This gîte is situated on the first and second floors of the building. The first floor houses a large lounge and an adjoining well equipped kitchen/diner. The second floor houses two double bedrooms. Bedroom one has a double bed and two single beds, with a cot bed. (if required) Bedroom two is the smaller of the two and houses a double bed. The gîte has retained some of its original character with its exposed ceiling beams and natural stone walls. The kitchen is well equipped and houses a cooker, microwave, fridge, dishwasher washing machine and iron. This property also has the added benefit of a large balcony. Our properties are situated in the small sleepy village of Latoue in the Haute-Garonne region of southern France. Latoue is ideally situated midway between the Atlantic and Mediterranean coasts, and gives easy access to the historic cities of Toulouse, Carcassonne and Albi to the east, Lourdes, Pau and Biarritz to the west, the Pyrenées and Spain to the south and the wine regions of Gaillac and Fronton to the north. Guests have full use of the communal areas which include: 10 x 5 metre (32 x 16 foot) outdoor pool which is open from May to October and which is cleaned daily. Separate entertainment/games room. Spacious gardens to relax in with various seating area. We only ask that if you wish to use the communal facilities that consideration is shown to other guests. A gem of a find in a beautiful region. I could begin by saying how pretty, clean, comfortable and well equipped the gite was. Or I could mention how lovely and well maintained the pool area and gardens are. Or maybe I'll tell you about all the charming little outdoor spaces you can choose to dine and while away the hours in. I could even mention how tranquil the village is, pretty much all you'll hear is the occasional cow and the charming church clock bells - and we were sleeping through them by the 2nd morning. But no... what I'd really like to say is, the one thing that makes Fran's place so special is .... Fran. We've stayed in France many times and this was hands down the most welcome, relaxed and looked after we have ever felt, while sharing someone's home. Fran strikes the perfect balance of being there if you need her (even if it's just for a chat) and respecting your privacy and giving you space. One word of warning - if she invites you for a glass of wine, be prepared to have more than one, and to go away with belly ache from laughing several hours later. We never generally go to the same place twice but in this instance we're prepared to make an exception. Latoue is set in a most beautiful, quiet and unspoilt region. Perfect for jaunts into the Pyrenees. If you're adventurous, be sure to check out canyoning with Horizon Vertical in St Girons and Kayaking with Pagaies at Valcabrère - these activities were major highlights of holiday. Thanks Fran - we'll be back. We spent a week at this lovely place. It's just beautiful! Our kids loved the pool and the entertainment room. A spacious house, clean and well-maintaind, good equiped kitchen. This place has a soul and gives you a good feeling, you feel immideately like you are at home. The host is a very warm person. I am happy we descoverd this place and we will definitely come back. Fantastic rustic french gite. Very authentic. Lovely big rooms and kitchen has absolutely everything. Lovely to sit out on the balcony for breakfast and evening drinks. Francesca is a great host and very welcoming, introducing us to her friends with whom we shared the odd afternoon biere or vin! Facilities great for the kids, swimming pool, grounds, toys, movie room etc. Latoue is a small quiet village with no shops but a great little van than sells fresh bread, pastries, wine etc a few times a week. It has a good little playground and little bridge for pooh sticks! But the village is close to Saint Gaudens for amenities and close to lots of good places for days out. We loved it and came home very relaxed - 5 stars! This was the perfect holiday. The Gite itself was lovely, it was well equipped and maintained. The amenities were fantastic. My 5 year old twins were in there element in the pool, in the entertainment room, and exploring the secret garden and grounds. The situation is idyllic in a traditional village but also within easy access of supermarkets and bigger towns and attractions. The owner (Francesca Miller) was always on hand to help and advise and was the perfect hostess. We will be going back next year and would recommend this holiday home. We had a fantastic week at La Grange. Francesca is the most thoughtful and kind hotess and the place is wonderful! We stayed with our 2 young children and my parents and it was perfect. The gardens are so beautiful with lots of gorgeous areas to sit and enjoy them and bbq! Brilliant games room with cinema and toys- the pool was fantastic. Francesca was so helpful and kind throughout our stay. Highly recommended. We had a lovely week at this beautifully maintained property. Three of us but plenty of room for more. The kitchen is huge and one of the best equipped we have ever had in a holiday rental, making cooking a pleasure. It is in a very quiet and peaceful area with nice walks around the lake. There are several large supermarkets in the nearby town of St Gaudens and from there you can take the train to Toulouse which we did and had a very good day out. All in all a lovely property with Francesca the owner being on hand to provide help and advice but never intrusive. We would love to return some time in the future. The surrounding area is ideal for walking, whether you are looking to take a leisurely stroll and simply admire the scenery, or go for a more energetic hike, there are many marked paths, and maps and guidebooks are also available. The climate is temperate, so is very well suited to outdoor pursuits. The winters tend to be dry, the summers hot, and both spring and autumn are mild, with no more than moderate rainfall. Gentle valleys and sheer mountains, peaceful lakes and abundant forests, medieval fortifications and Romanesque architecture are just some of the features you will discover between the Garonne and the Pyrenees. Saunter as you please along the paths which crisscross fields and vineyards, follow the steep peaks and upper Pyrenean valleys, immerse yourself in town or village life or soak up the goodness of thermal spas. The inhabitants of the Haute-Garonne are extremely hospitable people and will be happy to reveal the secrets of their art of living. At Gites Haute Garonne, we have three rental properties. We live on site and therefore able to greet you and sort out any problems.